The snow is falling and the roads don't look too inviting, so I won't be attending the Vermont Farriers Association's clinic today. Allie Hayes of Horsescience is giving one of her stellar anatomy classes, and I was hoping I could get there. If you're already in Vermont, here are the coordinates: Howden Hall, 19 West Street, Bristol, Vermont (about 30 miles south of Burlington); time: 8:30 AM to 2:00 PM. Diane Saunders is the organizer: 802-453-3750. The Vermont Farriers Association is a terrific organization that welcomes both mainstream farriers and newstream hoof trimmers, and they all seem to get along. Vermont's that kind of place. If you ever have a chance to attend a VFA event, go. Click or double-click on the image at left to see an enlarged example of one of Allie's leg models. One of the "ah-ha!" moments at her clinics is seeing legs of horses at different stages of growth and development, side by side. Or, seeing a normal foal leg like this one compared to that of a foal with a limb deviation. What looks like minor "toe in" or "toe out" from the outside is interesting to study within the limb when you have an aid like this. A "growth plate" is the softer cartilage portion of the foal's bones, where growth takes place. 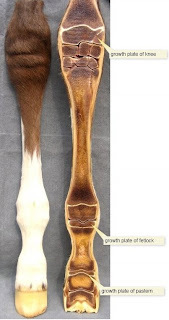 The plates gradually ossify (turn to bone) or "close", but at different stages of development, so that corrective trimming of the hoof may be helpful for certain deviations, but only until a certain age. You may have heard it asked of a Thoroughbred colt, "Have his knees closed yet?" It makes a big difference where a conformational/skeletal deviation is, what type of deviations it is, and how old the foal is when treatment begins. Some deviations require surgical intervention, while some respond to splints, extension shoes, frequent hoof trimming and increase or decrease in exercise and nutritional values. The leg you are seeing has been surgically prepared and then freeze-dried by Horsescience for use as a permanent study or teaching aid by equine professionals. Order yours at horsescience.com. 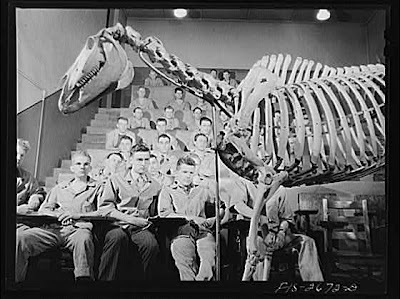 Vet school anatomy class image courtesy of the Library of Congress.